For applicants applying under the ECA category, the best place to be informed is the University of Delhi website. However, admission into a college only depends upon the availability of seats in that particular college and is not subject to clearing the final trials. The time limit is up to 3 minutes per candidate. Accompaniment/accompanists are compulsory, however, not more than one accompanist per participant shall be allowed. Candidates can use electronic taanpura/shrutipeti. Candidate should come prepared with at least 3-4 numbers across different genres to showcase their talent. No time will be given for tuning the instrument. Candidate should ensure that the instruments are tuned at the beginning of the trial. 1. The candidate should introduce the item in not more than 30 seconds. 2. Not more than one accompanying instrument shall be allowed. 3. Candidate can bring his/her own musical instrument. 4. The performance should not exceed 3 minutes. 5. No time will be given for tuning the instrument. Candidate should ensure that the instruments are tuned at the beginning of the trial. 2. Candidate can bring his/her own musical instrument. 3. The performance should not exceed 3 minutes. 4. No time will be given for tuning the instrument. Candidate should ensure that the instruments are tuned at the beginning of the trial. 5. Candidate should preferably use an accompaniment and/ or bring along an accompanist, however, not more one accompanist per participant will be allowed. which can showcase their talent. Colleges offer ECA quotas in five categories under Music (Vocal): Indian Music (Classical, Light and Vocal) and Western (Classical and Light). The ECA committee for Admissions would consist of the Principal or the Principal nominee, two experts from eminent institutions like the Sangeet Natak Academy and the College Cultural Council convener or nominee. 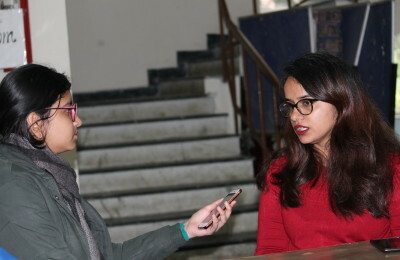 This year, 51 colleges in Delhi University are offering such ECA quotas, including Sri Venkateswara College, RamJas College, Zakir Hussain Delhi College, Maitreyi College, Sri Guru Tegh Bahadur Khalsa College, Gargi College, and Kamala Nehru College. The more comprehensive list is provided in the official Bulletin for Information for Admission to UG Programmes (2018-19). Students do complain about the lack of clarity in the University website or even the official Bulletin of Information about the specific guidelines. “I was very unclear and I almost missed my prelim trials. Someone told me how it happens on the very last day and I went. Naturally, I was very nervous. However overall, it went pretty good,” says Gaurav Sharma.